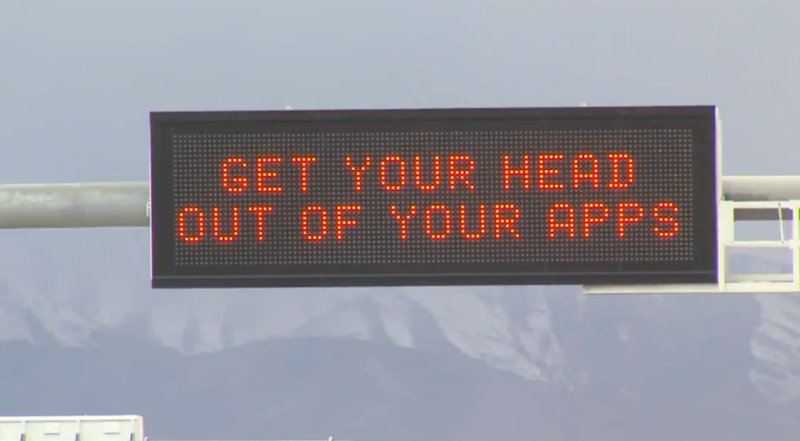 The Utah Department of Transportation has devised a punny way of getting people to talk about road safety and cell phone use while driving - by posting slightly suggestive puns on electronic billboards along the roadway. Welcome to the age of memes and social media, America. According to NBC News, a recent message telling motorists to “Get your head out of your apps” is just one of many that are part of the Salt Lake City DOT’s “Message Monday” program to raise driver awareness and try to stir discussion about driver distractions. While many locals went to social media to praise the signs, this creativity is of course slightly alarming to some motorists who “understand the concern,” but don’t find it appropriate. 8% of motorists who took part in the local KSL radio Facebook poll found it offensive.